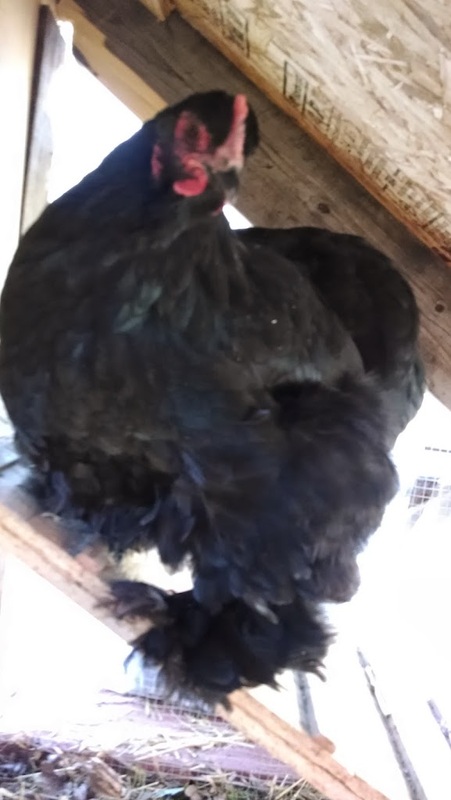 It was on the fateful day of Friday, January 17, that I finally decided the chicks could no longer stay in the indoor coop – they were just too big and I expected them to start acting out through boredom. I’d taken them outside for a look-see earlier in the week. So, at the stroke of midnight, my son helped me load them into a plastic tote and take them to the hen house. I didn’t want to wake them too much, so we didn’t turn on any lights. I wore my camping headlamp and hoped that the local police wouldn’t find that time to drive by and we’d have to explain the intricacies of moving chickens at night! I took each of the youth and put them in the coop. The elder hens clucked a bit, but didn’t quite wake up. By the next morning, they were in the “basement”, the space under the coop. Herded there by the elder hens. Later in the day, I found they were huddled at the end of the chicken run, terrorized by the elders. I sighed and entered the run – the fully enclosed 2 foot high run – on my hands and knees and crawled toward the youth. I wanted to herd them back into the basement where they might feel safer. The alpha hen, Dolly the Barred Rock, took after me, squawking and flapping her wings. I brushed her back and she just settled back to cluck angrily. Then Penny, the Rhode Island Red, took her turn getting after me. I brushed her back too. I finally gave up because the young ‘uns wouldn’t herd very well. So I crawled back and emerged from the run. I was worried that the chicks wouldn’t be able to get any food and water, so I visited the coop after dark on Saturday with my flashlight. The elders were in the coop settling in for the night, and the teens were out and partying – they were peeping away, eating and drinking and having a great time. I set my mind at ease. The next morning, Sunday, the youth were again herded to the end of the run by their elders. Every time they tried to get to the general feed and goodies, they were intimidated back into a cluster. One of the youth, an Araucana by the name of Aury, had a bit of blood on her beak from pecking. So I drove to the drug store for hydrogen peroxide and swabs. My chicken mentor, Andrea, asked me if I’d coated the young ones with Pick-No-More, which I’d forgotten to do. 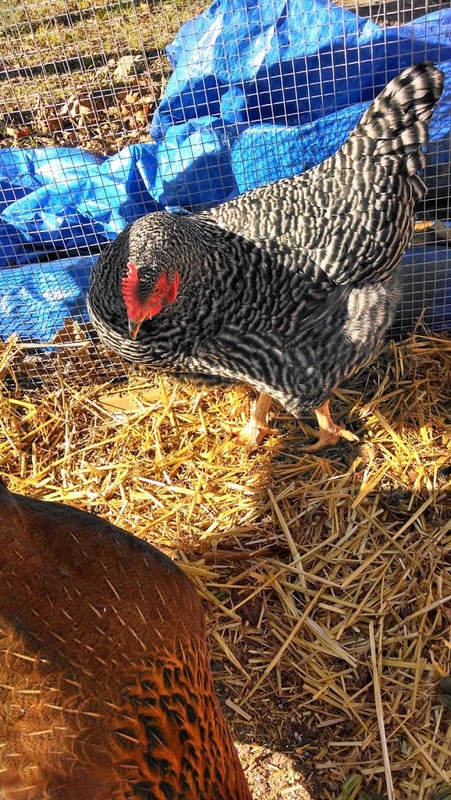 So….back into the chicken run I crawled – only this time I put some straw down so I had a cleaner crawl. I slathered each of the chicks with the PNM, then swabbed Aury with the hydrogen peroxide and then slathered her. Neither Penny nor Dolly tried to come for me this time….they knew I was ALPHA HEN, so all they did was cluck angrily. Penny did take a peck at one of the chicks and discovered the awful taste of PNM, so she went off. By Monday, when I found the chicks herded back into the basement, I started throwing handfuls of scratch and pellets into the understorey for them. I also threw some greens, but C.Lo, the black cochin went after them. So I sneaked around to the back of the coop while C.Lo was otherwise occupied and stuffed bits of greens through the hardware cloth for the chicks….they love their greens and were quite happy. 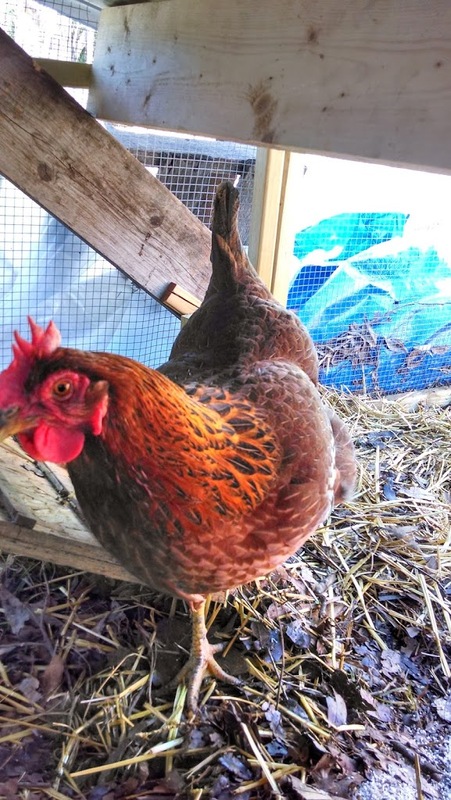 Tuesday, I knew the routine…give scratch and greens to the hens, then retire to the coop to replace pellets and water and then throw scratch and pellets into the basement. Then I sneaked to the back and started stuffing greens. By now, the chicks expected it and they were eagerly peeping….which alerted C.Lo, who came charging in to intimidate them and steal the greens. I yelled at her, hissed, whistled and otherwise tried to scare her away. She just stared at me. I was stumped. C.Lo was the bully; none of the other hens seemed bothered by the chicks by now. I got to thinking about it. C.Lo had been the one who was most friendly to people in her former home. The other hens had come from large flocks and so were not so people friendly. 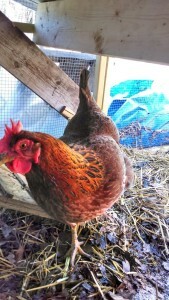 I realized that C.Lo would greet me when I put food and water into the coop area and cluck at me. Then, when I went to the run to throw scratch, she’d come out too. It hit me….C.Lo was jealous of the chicks! And I was giving her negative attention, but attention nonetheless. So I decided to change my tactics. On Wednesday I threw scratch and greens in the run for the hens. I also cut up pieces of pear. But C.Lo wasn’t allowed by the other hens to partake of the pears – they jealously guarded them for themselves. So I then went to the coop area with pellets and water and C.Lo followed. I cut pieces of pear just for her and talked to her. I cut greens just for her. And the chicks ventured out to partake of pellets. Every time she started to herd them back to the basement, I called to her and gave her another piece of greens. Thursday I continued the special C.Lo treatment, which seemed to be working rather well. The chicks would make forays out to the run to pick up some goodie and then retreat to the basement area. At least they were eating and drinking. And then….. The weather report said we’d get an arctic cold front with nighttime temperatures in the teens. Ouch! How were the chicks going to survive if they couldn’t get into the warm coop at night? I started by tarping the run, and re-stapling plastic sheeting around the coop and understorey to keep out drafts. I gave the hens and chicks extra scratch that evening so they could have some fuel to keep them warm. And I called my mentor for ideas – since I had no lamp in the coop for warmth, she suggested heating a brick in the over and then wrapping it and putting it into the coop. It would radiate enough heat to take the edge off. So I heated a brick for about 45 minutes at 350 degrees, then wrapped it in an old sheet, and put it inside the understorey area. And crossed my fingers. Friday morning I was anxious. When I approached the run and unwrapped it for the sun to warm the chickens, only the hens were clucking. I didn’t hear the familiar peeping of the chicks! I spread scratch and greens and then went to the coop to put in feed and water. The water was only partially frozen (that was a good sign!) … and out from the basement came all four of the chicks! And C.Lo didn’t intimidate them either (although I did have special treats for her, too). With the weather turning warm again for several days and, even though another cold front is coming through in a few days, it is not expected to get quite as cold as it was Thursday night. And the chicks now seem to have some freedom of movement and certainly can access food and water. Maybe the Great Chicken Integration will happen after all and I’ll have a whole flock of 8 chickens. And as a bonus, I found not just the one egg (green, from the Araucana) that I’ve been finding for the past week or so, but a brown one too! 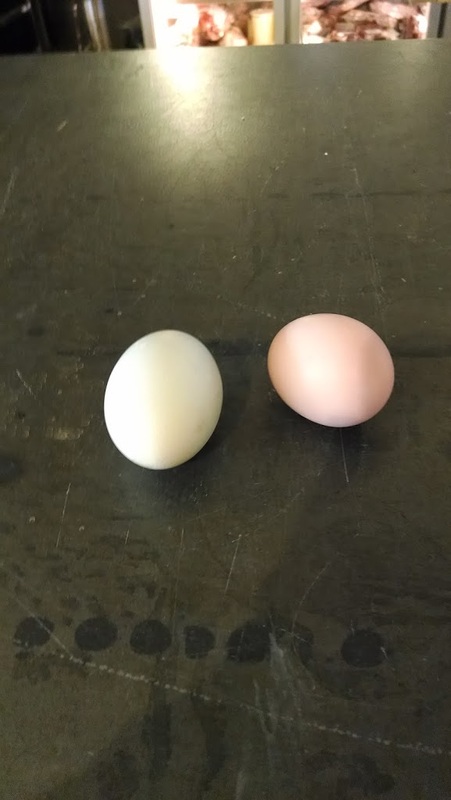 On the coldest night we’ve had, another chicken has decided to start laying. Woohoo! Posted in araucana, backyard chickens, barred rock, black cochin, chicken flock, flock integration, rhode island red.